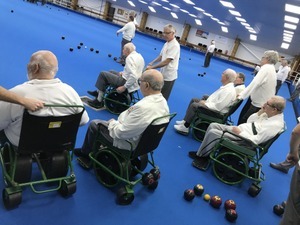 Terry runs a section of the club which offer opportunities for bowlers who have had a stroke to get back onto the green. Terry has a medicated group of volunteer helpers who help during the regular weekly sessions. Over the years Terry has raised enough funds to purchase 8 Bradshaw Bowls Buggies. 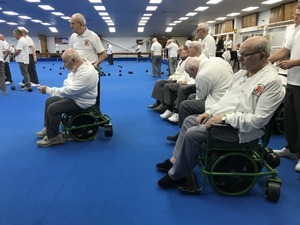 Six are currently in use by his group; these chairs are also made available to club members too. the other two Buggies are being used by local clubs for their members. Terry wanted Ian to have a look at the Buggies and give them a sort of ‘MOT’. All the machines were in good or very good condition and Ian was able to share with Terry some hints and tips on looking after them based on his years of experience.